One of my kids has been asking for candy corn. Traditional candy corn is not gluten free nor is it dye free. We don’t typically eat a lot of things with dye in them, sometimes we indulge, but one of my kids cannot eat dye. I had been intending to search for some when I came across it at Whole Foods. I grabbed a bag and my kids were so excited. Everyone liked them and the ones who’ve eaten the traditional said they tasted just as good or better than the traditional ones. Since finding these at Whole Foods I have since found an awesome place online that offers I really like this online store. I am waiting to receive my first order right now. They carry an amazing variety of healthier candies made with all-natural ingredients — no artificial flavors, no artificial colors or dyes, no hydrogenated oils, no high fructose corn syrup. P.S. If you place your first order through this link, I get credit! Hello! Back with a favorite find….I know it’s been a while. This is my newest favorite find. Off the Eaten Path Rice and Veggie Crisps. The are are healthy and delicious snack that I and my kids all love. They are made with rice, green peas, yellow peas and black beans. They also contain 3 grams of fiber, 3 grams of protein and less the 1 gram of sugars in a 1 ounce serving which is about 15 pieces. The pieces are a little larger than a half dollar….uh, wait…..I just totally aged myself. For those of you who remember half dollars, we understand one another! For, those who don’t know, I’d say about the size of a mini rice cake, only very thin. They are very crisp and not really flavor packed on first bite, but there’s just something about them that makes you want to eat more! You can check out other Favorite Find Friday items here. I am digging Aldi and their expanding line of gluten free products. Everything I’ve tried I’ve been happy with, with one exception, that is the cornbread mix. I just think it tastes and texture was more like cake than cornbread, I think it would make an excellent blueberry cornbread cake. Now these crackers look a bit deceiving. On the package they look similar to Crunchmaster crackers but they are not! These have a texture that is nothing like that. 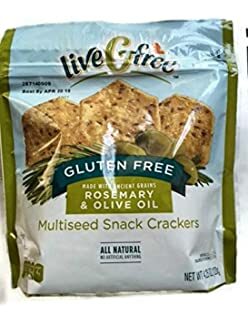 They are crisp and crunchy like a regular gluten full cracker. They are covered in spices and bursting with flavor. Not to mention that the price is exceptional, $1.49 for a 4 oz bag. They also have these crackers in a plain sea salt flavor. Ingredients: Brown rice flour, long grain white rice flour, brown sugar, sesame seeds, long grain brown rice flour, seasoning (Whey, salt, sugar, onion powder, torula yeast, spices, dried parsley, maltodextrin, canola oil, soybean oil, rosemary extract, natural flavors), vegetable oil (corn and/or canola oil and/or sunflower), corn starch, flax seed, quinoa seed, millet, oat fiber, natural flavor. Contains sesame and milk. I don’t know if you use coconut flour much or not in your GF baking. I don’t use it a ton. It has a different texture, a bit more dense and heavy. But, one of my favorite recipes to make with coconut flour is muffins. Coconut flour is a bit more expensive but the great thing is that a little bit goes a long way. If it was in the budget I would definitely get the coconut flour at Tropical Traditions, but this has been a good alternative for grain free baking. Another bonus is that when you cook with coconut flour you don’t have to use any gums. I purchased this at Sam’s Club for less than $10/5#. It was an incredibly good price, especially since it is organic. Finding affordable pre-made GF flour blends is no easy task. So when I found this at Sam’s Club I was thrilled. This is a 5 pound bag for about $10. This is suppose to be a cup for cup substitute for regular flour. I’ve already converted most of my recipes to GF so I’ve made adjustments for that, so I don’t know if I can really speak to the actuality of cup for cup substitute. But, I was pretty happy with the flour over all. Everyone in my family didn’t really notice a difference, I did notice a slight flavor difference. But, it is a healthier blend of flour with more whole grains and less starches, this is a definite plus. Ingredients: Whole grain sorghum flour, brown rice flour (rice flour, rice bran), whole grain millet flour, rice flour, food starch-modified (tapioca), whole grain quinoa flour, xanthan gum. I think this is a great alternative to making your own flour blend at home. 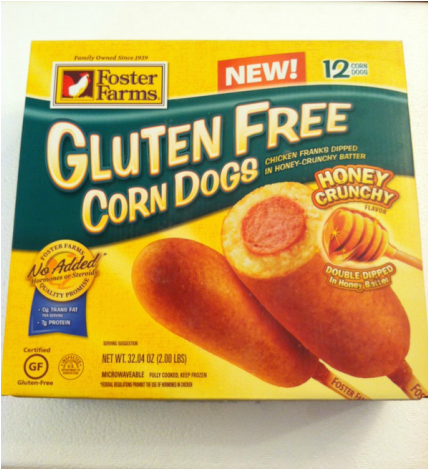 I know this is long overdue, as I haven’t shared any favorite finds for quite sometime so to kick things off again, my favorite find for this Friday is Foster Farms Gluten Free Corn Dogs. My mom found these at Kroger and told me about them. This is not a super healthy item, but it is definitely a treat and a quick and easy one at that. Also, they are very reasonably priced. This box of 12 was $5.99. 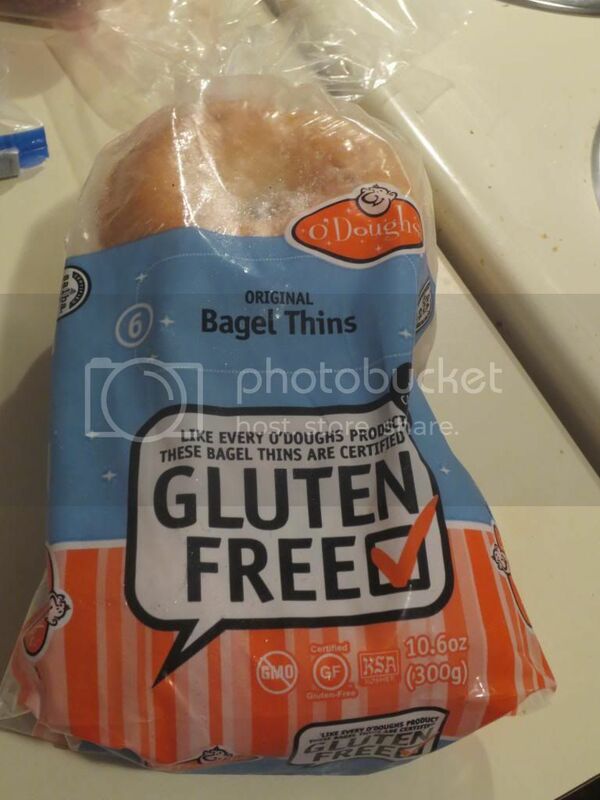 My favorite find today is…… O’Doughs Bagel Thins. I bought these on a whim. I don’t usually buy bagels because they are so expensive and when you have a family of six, spending $1 per bagel just isn’t going to fly too often. But, these were $4.99 for 6 and there was $1 off coupon. Everyone in my family loves bagels so this was a rare treat. My friend in TN says that GF aren’t really bagels and I would agree mostly. But, these met the match for us. I think the thinness helps the taste a lot. I got the original, that’s all they had at my Earth Fare, but I see on their site that they offer Apple Cranberry, Sprouted Whole Grain Flax and the Original. And they are only 100 calories, IF that’s important to you, GMO free and egg free! A friend called me recently and told me that had a special “while supplies last” GF section at Aldi. It took me a week but I made it over there. They have many convenience items. I haven’t tried any of them yet, but I bought a few. The kids have eaten the GF fruit bars. It’s kind of a no oats granola bar. They love them. Anyway, even though I probably wouldn’t use most of these items on a regular basis, it is amazing to find and have GF convenience food at a good price!! So, if you have an Aldi near you, check it out and see if they are offering a GF section. If you haven’t been to the new site to re-subscribe you can do that by visiting the blog and follow link.